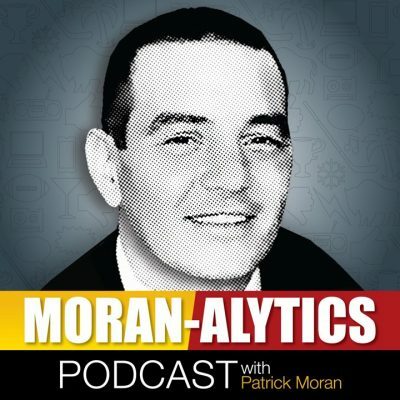 On this episode of the Moran-Alytics Podcast, Patrick Moran scores a rare interview with former Buffalo Bills 1992 first-round draft pick John Fina on a variety of topics. Fina talks about growing up in Arizona and playing football on the defensive side of the ball before eventually getting switched over to offensive tackle, a position he originally hated. He discusses his recruitment that led to him going to the University of Arizona and what the process was like between the end of his college career and the NFL draft, including not thinking he would be a first-round pick until legendary coach Bill Belichick told him otherwise. Fina recalls his reaction to finding out he was going to Buffalo with the 27th overall selection in 1992 and what it was like being in the locker room with the likes of Jim Kelly, Thurman Thomas, Bruce Smith, Darryl Talley, etc. Fina became the starter at left tackle in his second season in what would be the Bills last of four straight Super Bowl appearances. John also talks about being the first player in team history to have the franchise tagged place on him in 1996 and shares his feelings about playing for Marv Levy. The interview is littered with great stories, including a Ralph Wilson/New Orleans tale and John recalling a time where he composed himself from punching out a nasty fan in the parking lot. They also talk about John’s son, Bruno, who has become a big football star as the same high school his dad played at. Bruno already has offers from USC and UCLA and is well on his way to being a name to look out for in the future. After that, Moran is joined by Joe (@BuffaloWins) for another installment of “The Run-In With Joe.” Today Moran is asking Joe about his experience of being among the 80,000-plus in attendance at Met Life Stadium in New Jersey for Wrestlemania 35 last weekend. Joe fought being sick to partake in Wrestlemania activities, not just the main show but also WWE Axxess and a few Indie shows as well. He talks about the Wrestlemania card being fun but long, escaping heavy traffic right after the show ended and points out a few of his highlights, favorite ring entrances and reveals if Wrestlemania is worth the investment. The two also discuss Tyler Dunne’s Bleacher Report story that recently went viral regarding Green Bay Packers quarterback Aaron Rodgers and former head coach Mike McCarthy’s alleged tumultuous relationship, including an angry Rodgers firing off at Dunne over published comments by former teammates in the story. They also take a look into the final season of Game of Thrones beginning Sunday, offer a prediction for how it ends and debate whether they’d rather watch their favorite shows on a weekly basis or binge-watching at once.